Shubham properties is a proprietorship firm dealing in Real Estate. our basic concept is to help our customers to BUY / SELL / Lease their properties or the properties. 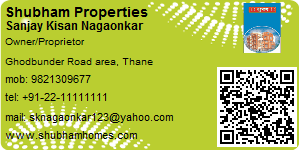 Mr. Sanjay Kisan Nagaonkar the proprietor of Shubham properties is a registered real estate agent in the state of Maharashtra, under the Maharashtra Real Estate Regulatory Authority. We have a experience of more than 8 years the real estate industry. Parijat Gardens is a 6-7 years old Residential Complex at Kasarvadavli, Ghodbunder Road, Thane. This complex has been developed by SOHAM Real Estate Development Company. The complex consists of 7 residential buildings; 5 buildings of 1 BHK, 1 building of 1 room kitchen & 1 building of 2 BHK. A Mandir, Community Hall & Green Gardens are the featured amenities of the Complex. Easy access to the main road. Mall, Petrol Pump, School, Hospital nearby. 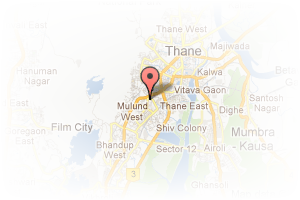 Address: Kasarvadavli, Behind Hyper City, Ghodbunder Road, Thane, Maharashtra, India. This Broker Profile page for "Shubham Properties" has been created by PropertyWala.com. "Shubham Properties" is not endorsed by or affiliated with PropertyWala.com. For questions regarding Broker Profiles on PropertyWala.com please contact us.